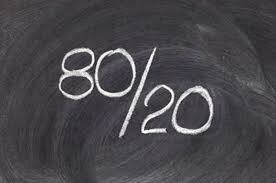 With the Patient Protection and Affordable Care Act, AKA ObamaCare, there are a lot of provisions to protect residents of the U.S. One of these new rules is the 80/20 rule. It is the percentage of your premium that your insurance company must spend on your health related costs. To break that down: 80% must be spent on your healthcare, 20% on administrative, marketing, overhead, and other operating costs. 85% must be spent of small business group premiums. Click here to read more about Small Business and the Healthcare Exchange. This doesn’t just affect ObamaCare plans: Anthem to refund Medigap policyholders in 5 states. What if my insurance company uses 75% of my premium? If your insurance company cannot prove that they used 80% of your premium on health related issues, then you will receive a rebate. Remember under the new Healthcare Exchange you will be guaranteed issuance regardless of preexisting conditions, this new rule means that there will be a greater pool of persons with health related issues, which means that premiums may increase the following year. Is the rebate based on my individual healthcare? No. The rebate is based on the provider’s spending as a whole on each particular plan. Who is checking up ony the Insurance Providers? Health insurance companies must report each year to the Secretary of Health and Human Services to prove their share of your premium. In Connecticut, $12,949,130 was refunded in 2013 to individuals, with an average of $168 per person. By the end of 2014 there will be a better understanding of whether premiums will be refunded or raised due to the health insurance companies reports. For questions in regard to the Healthcare Exchange premiums for your state call 800-930-7956 or contact Medicoverage.